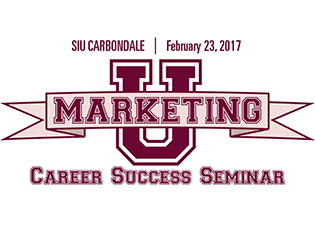 A career success seminar developed by the alumni of the SIU Marketing department to boost College of Business students’ success in their job hunts and early careers will take place on Feb. 23 in the Student Center. The seminar, known as “Marketing U,” is open to all business majors and minors, and its goal is to help students build their professional knowledge and professional network in just a few short hours. To this end, several successful alumni and friends of the college have come together to share their professional knowledge and network with students. During the day, students can attend up to three presentations that last one hour a piece. Sessions will include interactive presentations and small group/one-on-one discussions with the presenters. Students will be able to network with the presenters, ask questions about any career topic, share their résumés, and learn about specific careers and industries. They will also be able to attend an informal meeting/networking opportunity with employers and SIU alumni. During the event, students will have an opportunity to have a professional head shot taken by an SIU University Communications photographer, but students must register and attend at least one session to have their photo taken. Mavis Adjei, the marketing chairperson and an associate professor of marketing, shared some advice on why students should attend the seminar. James Karayiannis is presenting “Entrepreneurship – Is Starting My Own Business the Right “Next Step” for Me?” Karayiannis, is an SIU alum and a member of the Marketing Advisory Board, is the president of Pinch Penny Pub and Copper Dragon Brewing Co., which are located in Carbondale, Illinois. He is a life-long resident of Carbondale and is one of the youngest members of the External Advisory Board. He has been a member of the board since fall 2004 and served on the Saluki Expo Committee. Karayiannis was board secretary in 2014 and vice chair for 2015. Richard Klassen, who will present “Negotiating the Salary Package After You Get the Job Offer,” earned a bachelor’s in marketing in 1975 from SIU. He is the retired chief marketing and sales officer of Delta Dental of Missouri, where he was responsible for all of Delta’s sales and marketing initiatives. Klassen’s focus has been on the strategic alignment of the corporation within the employee benefits market dealing with companies of 10 employees up to Fortune 500 companies, including the St. Louis Cardinals, Enterprise Rent-A-Car, Boeing and Anheuser-Busch. Klassen, a member of the College of Business Hall of Fame, also is a member of the Better Business Bureau Board, the College of Business Dean’s External Advisory Board, the Department of Marketing Board of Advisors and the personnel committee for Ladue Chapel. He has been a member of the marketing board since fall 2004, serving as chair in 2009, vice chair in 2008 and board secretary in 2007. He also was a member of the Saluki Expo Committee. Nick Mergen will be presenting “Do’s & Don’ts of the Job Interview Process: Before, During, and After.” Mergen joined the SIU College of Business Marketing Department External Advisory Board in 2014. He is the district marketing manager for the Federated Insurance in O’Fallon, Illinois. Mergen comes to the board with more than 10 years of experience with Federated Insurance. He joined the board so he could share what he has learned through his success at Federated with the College of Business students that the company intends to recruit and hire. Mergen, the board secretary for 2016-2017, said he is looking forward to working with the college to better prepare students for their careers.